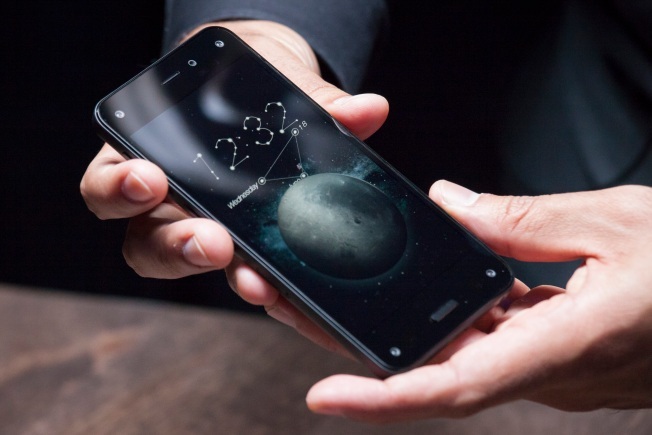 Amazon's new smartphone will serve as your eyes and ears. Snap a photo of a book title, and it'll show you where to buy it. Listen to a song playing in the background, and it'll direct you to that tune on Amazon. It can even direct you to knowledge: Snap a shot of a painting, and it'll pull up a Wikipedia entry on it. The new Firefly feature also lets you snap bar codes, phone numbers and more. It's part of the new Fire Phone, which Amazon.com Inc. unveiled at a Seattle event Wednesday. The phone shares many characteristics found in other Amazon devices and adds functionality, such as images that are constantly changing depending on your angle of vision and the ability to scroll content by tilting the device. — The phone is smaller than leading Android phone, but larger than Apple's iPhone. CEO Jeff Bezos calls the screen, measuring 4.7 inches diagonally, ideal for one-handed use. — The Fire Phone will bring features found in other Amazon devices, such as X-Ray for supplemental content and Mayday for live tech support. There's also access to e-books to borrow for members of Amazon's $99-a-year Prime program. — Bezos touts the camera on the new phone. He says it has image stabilization to counteract shaking as people take shots. Amazon is offering unlimited free storage on its Cloud Drive service. — The phone will come with earbuds that have flat cords and magnets to clasp them together, so tangled cords will be history. — Bezos says images are typically flat — and Amazon wants to change that. You can rotate the phone around and get a different view depending on your angle of vision. He says the phone is basically redrawing the image 60 times per second. Bezos calls this "dynamic perspective." — The phone's auto-scroll feature lets you scroll down by tilting the phone. Samsung's Galaxy phones have that, too. — Amazon's Kindle tablets run a highly modified version of Google's Android system, and it's likely an Amazon phone would do the same. That means apps for the phone would be limited to what's available through Amazon's own app store. The store has grown to include more than 240,000 apps, but there's much more for Android and Apple devices. — The Wall Street Journal has reported that AT&T will be the exclusive carrier for the new phone. If that's true, it would be a similar approach to what Apple took when it unveiled its first iPhone in 2007. AT&T had exclusive rights to the iPhone in the U.S. until 2011, when Verizon and eventually others got it, too. — Analysts say the phone might come with a data plan that could let owners use Amazon services without using up any data. — AT&T has announced prices on its website: $200 for a base model with 32 gigabytes and $300 for 64 gigabytes. Both require two-year service contracts. — Facebook once tried to release a phone tied to its services. The HTC First, released in April 2013, came with Facebook's Home software, which takes over the phone's front screen to present status updates, messages and other content. Both the phone and the software flopped. — Google also has its own phones under the Nexus brand, mostly to showcase its Android operating system. Google makes Android available for free for any phone manufacturer to use and modify. That makes it difficult to know what's really Android and what's a modification. — Amazon.com Inc. got its start in books and soon moved into music, video, devices and more. Analysts believe the goal of an Amazon-branded smartphone is to get customers to buy more things from the nation's largest e-commerce company. The device might include an Amazon shopping app or other features tied to the company's products and services. — Competing won't be easy. Amazon is arriving late to a tightly contested marketplace. Samsung and Apple dominate worldwide smartphone sales with a combined 46 percent share, according to IDC. And in the U.S., Apple leads with more than 37 percent, with Samsung at nearly 29 percent. — Amazon has tried to chip away at Apple's top position in the tablet market with its Kindle Fire HDX tablet, which beats the iPad Air's screen resolution and is lighter and cheaper. Still, the iPad dominates the category while Amazon has seen its market share shrink from 7 percent in 2012 to 2 percent in the first quarter of this year. — Amazon's first gadget was a Kindle e-reader, released in 2007. Although there are plenty of devices that do more, many people still prefer stand-alone e-book readers because they typically have better screens for reading in direct sunlight and don't have distractions such as Facebook and email. — The company started making Kindle Fire tablets in 2011. The latest models, HDX, are notable for a Mayday help button that accesses live tech support 24 hours a day, seven days a week. You see the representatives in a video box, but they can only hear you and see what's on your screen. They can also help guide you by placing orange markers on your screen or taking control of your device completely. — In April, Amazon released its Fire TV streaming devices. What sets it apart from rival gadgets is a voice search feature that lets you speak the title, actor, director or genre into your remote to get matching content on the TV.